The new Philips voice recorder app allows you to be productive on the go. Record, edit and send your recordings for transcription from anywhere and reduce your document turnaround times. The app allows you to take advantage of every spare minute; whether it is time spent outside your office, travelling in your car or waiting at the airport. The app offers professional recording as well as editing functions, such as insert, overwrite, append and cut recording sequences. You can assign properties to your recordings such as an author name, recording type and category. These will make the categorization and management of dictations a lot easier. The included priority-setting option can be used to alarm transcriptionists that a recording is urgent and should be processed with priority. This helps urgent tasks get processed quicker. The widget is a shortcut button which you can place on your mobile home screen. Once clicked, it immediately starts recording, saving you time and hassle. This is also perfect for spontaneous recordings. The barcode scanning option enables you to link client or patient data to a recording by simply scanning over a barcode, even from a display. This ensures reliable assignment of your files and speeds up your workflow. You can easily import your client or patient list, making it easier to assign recordings to the correct file and speed up transcription. The car mode is perfect when you are driving or on the go. It provides a simplified interface with large buttons, so you do not need to glance down at your mobile when you are dictating. To make sure your data is kept completely safe, file transfer is encrypted via SSL technology and for maximum security, you can even encrypt your recordings. The app allows you to customize its buttons to fit your individual preferences, so you can record, edit and send dictations quickly and easily. IT administrators can centrally manage, configure and update the dictation app across multiple mobile phones, saving time and resources. 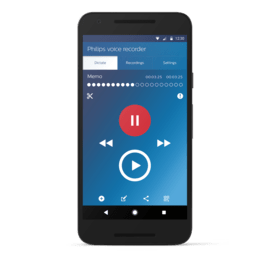 Philips voice recorder for Android has been tested on the devices above but should be compatible with all Android devices that run Android 4.2.1 and up. How can I start and finish a recording? How can I send a recording? How can I cut a sequence from an existing recording? How can I send my recording to SpeechLive? How can I send my recording by email? How can I select multiple recordings? How can I change the properties (e.g. Worktype) of my recording? How can I change the winding speed for playback? How can I delete a recording? Which sending or sharing options do I have? Which editing modes do I have and what are the differences? How does the automatic purge function work? Can I customize the toolbar functions at the bottom of the recording screen? Can I dictate and have an active call at the same time? I am using a smartphone. How can I send my dictations?